Our Accounts Manager Tracey Newman became the 47th member of our 25 year club earlier this year and celebrated at the Grouse Inn, Oldfield with 23 other club members who all have over 25 years continuous service with the Company. Tracey joined the Company as a Customer Service Assistant before studying for accountancy qualifications and moving to the Accounts Department. 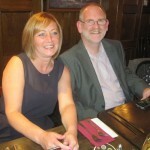 Tracey Newman with Chairman Tim Parkinson at the celebration dinner.